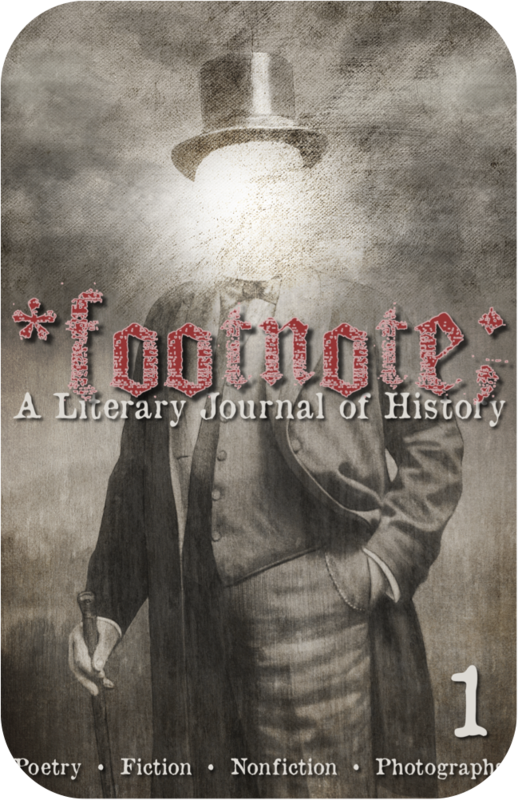 Footnote is our annual literary publication dedicated to historical and contemporary views on history. 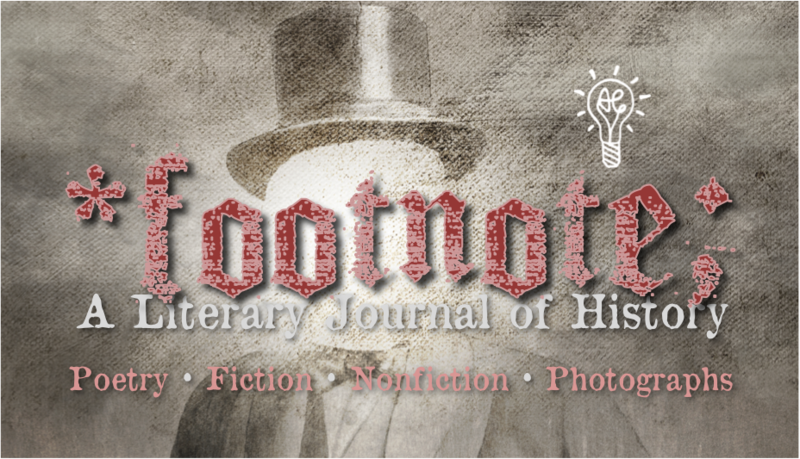 It contains poetry, maps and historical photographs, fiction, essays, articles, and nonfiction by various authors, both contemporary and historical, about any topic of history. 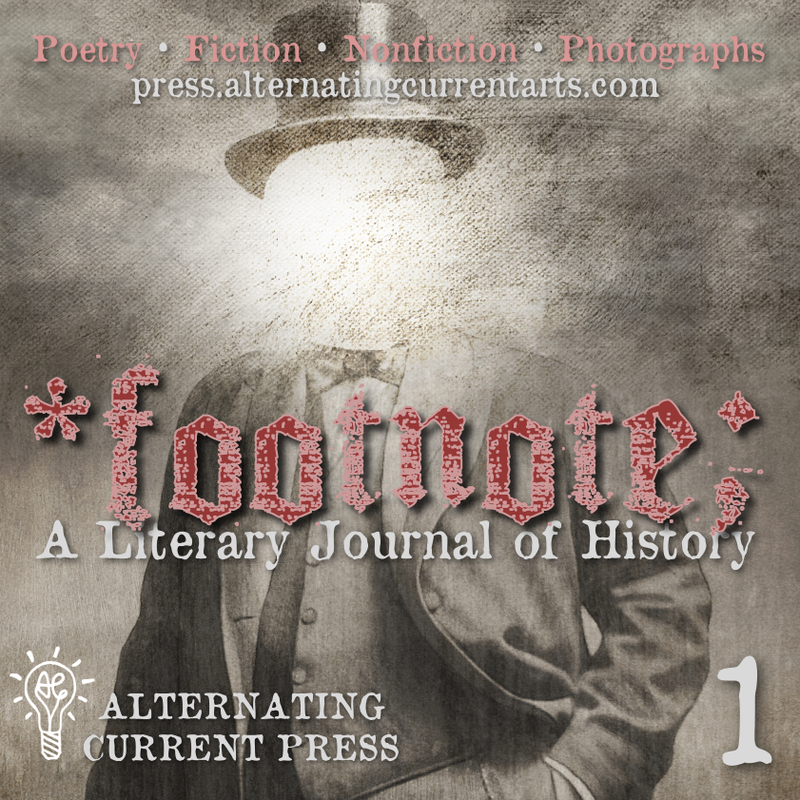 History is our passion here at Alternating Current, and we are excited by pieces that give an author’s intimate or emotional take on historical places, people, events, or ideas. Within our pages, you will find contemporary outlooks on history right alongside little-known public domain works that feel as fresh and vibrant as if they were written today. Here, the old meets the new in an explosive way that has never before seen the page, and we welcome you to discover fascinating history from a personal, non-scholarly literary approach. From our history, we learn our future, and there are few things more rewarding. We are looking for pieces that have heart, curiosity, purpose, and bravery. We want to be moved, and we want to learn. From our accepted submissions for each year, we take each piece and find its place in the whole, creating a conceptual feel from cover to cover that digs deeper than just chronological order. We couple those submissions with public domain pieces that comment on the same topics, so readers get to see modern perspectives on what is old, juxtaposed with old perspectives on what was then considered modern. Alongside that, we feature photographs, maps, illustrations, and interactive QR codes, so you can learn more about each topic. There is no set theme per issue. We collect and compile a conceptual arc based on the pieces we receive and the topics they cover. This means that each issue is completely fresh, has a different feel and atmosphere from start to finish, and could cover any topic of history in the known world. We’re not just here to entertain; we’re here to educate. It is our hope that you will learn and get curious and go do some research ... but rest assured that if you’re just here for the good writing, our highly selective submission and editing process will give you that, too. Individual pieces of poetry, prose, or hybrid work with themes of history (whatever that means to you) considered. Pieces must noticeably fit the abovementioned theme. 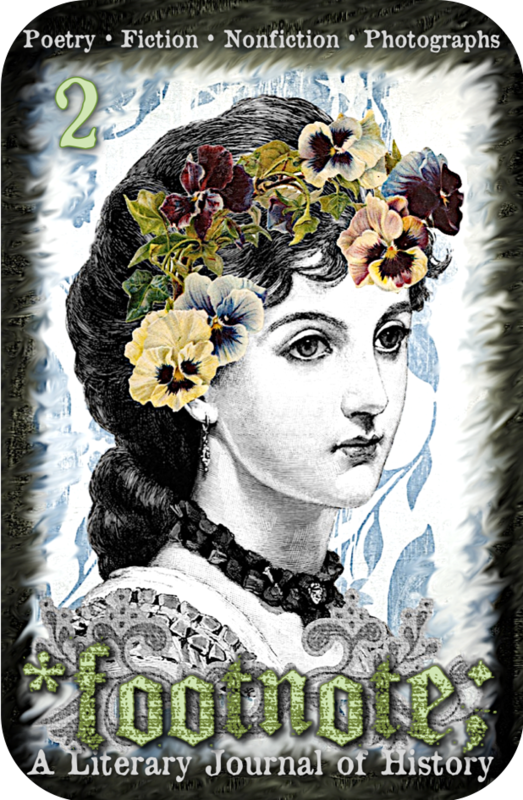 All genres, styles, lengths (within reason), and subjects within the theme considered. Work may be previously published; do not list acknowledgments unless/until accepted. We will consider reliable translations for this category, within reason. Pieces can be submitted for free during Black History Month (February), Women’s History Month (March), and during our Submit Anything! Open-Reading Period in September and October of each year. YOU MAY ONLY SUBMIT ONCE PER MONTH DURING FREE MONTHS, AND ONLY ONCE PER MONTH TO ANY FREE CATEGORY TOTAL. All pieces selected are guaranteed publication in Footnote. There is a $200 bar allotment for each issue of Footnote. 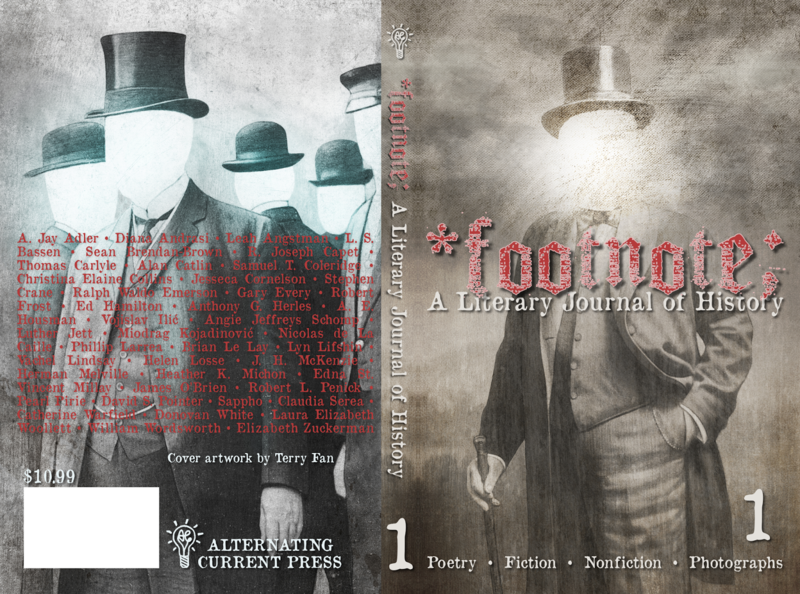 All authors published in the issue receive an even division of that amount upon publication in an opt-in system (which you will choose at payment time), complimentary digital copies of the issue, and at-cost print discounts (without obligation). The Top 12 Charter Oak Award Finalists receive publication on The Coil, as well. The Charter Oak Award winner receives a $100 honorarium, publication on Alternating Current Press’ website, publication on The Coil, a printed certificate, and our virtual medallion imprint for use on the author’s websites and published books. Second and third place winners will receive a unique gift each from a sponsor, publication on Alternating Current Press’ website, and printed certificates. We do not give out complimentary print editions, except to the first-, second-, and third-place winners of the Charter Oak Award whose work is therein contained. Click to download high-resolution front cover. Click to download high-resolution full jacket. Click to download high-resolution social media image. 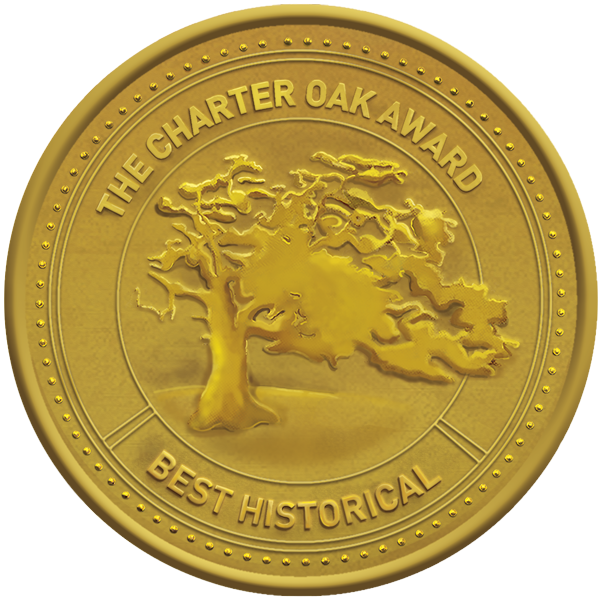 Aligned with each issue, we feature the annual Charter Oak Award for Best Historical. Of all the pieces submitted each year, an external judge selects a winner and top finalists. The Charter Oak Award winner receives a $100 honorarium, publication on Alternating Current Press’ website, publication on The Coil, a printed certificate, and our virtual medallion imprint for use on the author’s websites and published books. Second and third place winners receive a unique gift each from a sponsor, publication on Alternating Current Press’ website, and printed certificates. The Top-12 winners and finalists all receive publication on The Coil, as well. Read past Charter Oak finalists and winners here. Finalist: “I Meet Geronimo” by Charles Bane, Jr.